According to the analyzes of ASSOBACAM (Banana Association of Cameroon) the exports of the first quarter of 2019 have increased by 6.4% compared to the 1st quarter of 2018. Despite a slight decrease observed in March, ASSOBACAM estimates that banana exports for the first quarter of 2019 totaled 62,961 tonnes, which is 6.4% higher than the 59,144 tonnes shipped in the first quarter of 2018. This increase in exports results from the performance of PHP (Plantations du Haut Penja), a subsidiary of the French company, Compagnie Fruitière. Its exports totaled 58,067 tonnes in the first quarter of 2019, an increase of 13,003 tonnes compared to 45,064 tonnes exported in the first quarter of 2018. 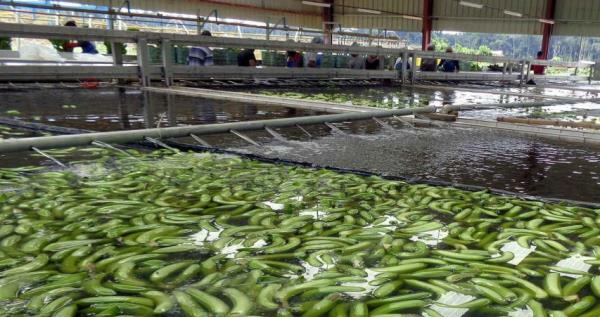 CDC (Cameroon Development Corporation), the other major banana player in Cameroon, whose production totaled 16,000 tonnes per month, has ceased exports since September 2018. Its plantations are located in the English-speaking regions of the country, who have different claims. Despite a crisis affecting production in some parts of the country, banana exports increased in the first quarter of 2019 compared to the previous year (Photo: Assobacam).